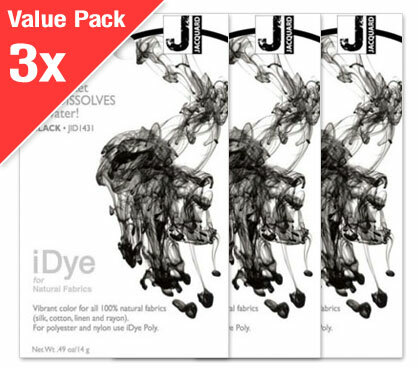 Jacquard ‘Bulk iDye’ is the cost effective solution for dyeing larger quantities of fabric in a washing machine. Each 450g pot is resealable and contains sufficient dye for up to 43kg/96lb of dry weight fabric (equivalent to 32 packs of 14g iDye). Bulk iDye comes in 10 vibrant colours for 100% natural fabrics such as cotton, silk, rayon, viscose, wool, and linen. Bulk iDye is ideal for dyeing large home furnishing items like sofas and curtains. It is also used extensively for dyeing costumes and props for all types of theatrical productions. The ultimate easy way to get gorgeous colour! • Read entire instructions before beginning. • Use the stove top method for iDye Poly and polyester blends. • Use constant agitation for uniform color. Please Note: Not all natural fibers are created equal. Results will vary depending on type of fabric. Read through all instructions before beginning. Please Note: Utensils and pot for dyeing should not be used for food. Stove top method:1. Fill a stainless steel or enamel pot with just enough warm water for the fabric to move freely. Turn heat on me-dium. 2. Add the iDye to water and bring to a simmer. Stir until fully dissolved. 3. Add pre-wetted fabric and bring temperature back to a simmer, just below boiling. 4. For cotton, linen and rayon dissolve one cup/237 ml of non-iodized salt in hot water and add to dye bath. For silk add ¹/³ cup/78 ml of white vinegar (instead of non-iodized salt). Avoid pouring directly onto fabric. 6. Turn off heat and remove fabric from dye bath. Be careful because fabric and dye bath will be hot. Wear gloves as residual dye can stain skin. Rinse in cool water. For post treatment during final rinse, fill container with water and add 2 tablespoons iDye Fixative per pound of fabric. Agitate for 2 to 3 minutes. 2. Add the iDye. Agitate for 30 seconds or longer until dissolved. 3. For cotton, linen and rayon add one cup/237 ml of non-iodized salt. Allow non-iodized salt to dissolve. For silk ,add ¹/³ cup/78 ml of white vinegar (instead of non-iodized salt). 6. For post treatment during the final rinse, add 2 tablespoons iDye Fixative per pound of fabric. Allow the cycle to complete. Most washers hold some water in their outer tubs at the end of a cycle. We recommend running a short wash/rinse cycle with your normal detergent after completing your dyeing. If you have hard water in your area, it is also a good idea to wipe down the inside of the tub. (Soap scum can build up and will hold onto dye particle. 1. Dissolve the iDye packet in approximately two cups of very hot water. 2. For cotton, linen and rayon, dissolve one cup non-iodized salt in approximately one quart of very hot water. 3. If you are dyeing silk, use ¹/³ cup of vinegar instead of non-iodized salt. 4. Pour the dissolved iDye and dissolved non-iodized salt or vinegar into the bottom of the washing machine tub. 7. When the machine has completed the wash cycle, allow it to complete the balance of the wash/rinse/spin cycle. 1. It’s not critical—either the non-iodized salt or the vinegar will work so just pick one. 2. Don’t add either, but use substantial heat in the dye bath (stove top method). 3. Do two separate dye baths—one with non-iodized salt and one with vinegar. This will probably be best for darkest colors. Polyester is hard to dye and requires very high water temperature to achieve good color; therefore, we recommend dyeing polyester only with the stove top method. 1. Fill a stainless steel or enamel pot with just enough water for the fabric to move freely. Turn heat on high. 2. 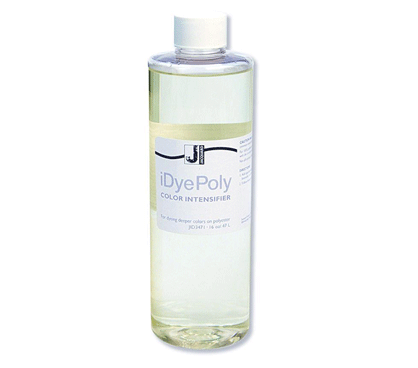 Choose the iDye Poly color closest to the iDye for natural fabrics color and add both to water. Add iDye Color Intensifier (14 ml/lb fabric) and bring to a simmer. Stir until dissolved. 3. Add pre-wetted fabric and bring to a rolling boil. 4. Add 1 cup/237 ml of non-iodized salt for cotton, linen and rayon or ¹/³ cup/78 ml of white vinegar for silk. Avoid pouring directly onto fabric. 5. Maintain a rolling boil and stir frequently for ½ to 1 hour. For uniform color, use constant agitation. 7. Gradually cool the fabric and rinse until nearly clear. For post treatment during final rinse, fill rinse container with water and add 2 tablespoons iDye Fixative per pound of fabric. Agitate for 2 to 3 minutes. Wash with a mild detergent in cool water and dry. When computing the percentage of iDye & iDye Poly (to achieve the 3-5% dye used), remember to take into account the blend of your fabric. Not all fabrics are blended 50/50. To dye one pound of 75% polyester & 25% cotton fabric, you would need approximately ½ oz. of dye. The ratio of iDye for Natural Fibers (cotton) would be 25% or 1/8 oz of dye. 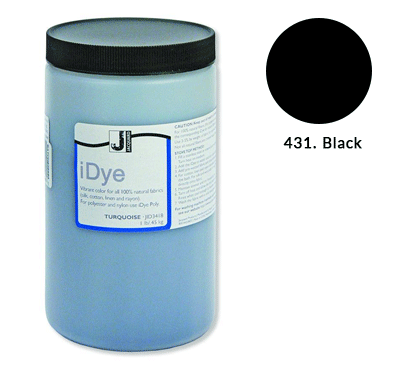 The ratio of iDye Poly (polyester) would be 75% or 3/8 oz of dye.